Trump Self-Owns In Rant Against Media: "When You Get Good Ratings, You Can Say Anything" [VIDEO] - Joe.My.God. 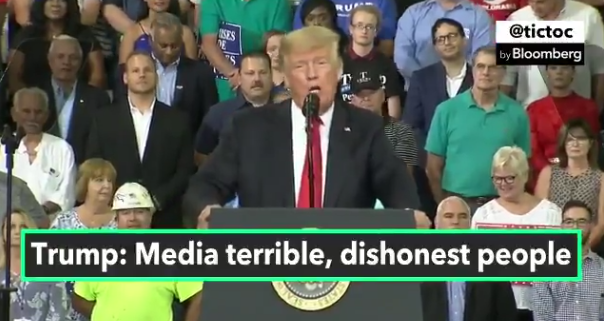 President Trump leaned into his attacks against the news media Thursday night at a rally in Indiana, blasting news outlets for what he said was unfair coverage driven by ratings. After mocking a protester who was escorted out at the beginning of his rally, the president predicted that “terrible” people in the press would report that the venue suffered major problems with protesters. “These are just dishonest, terrible people,” Trump continued, referring to assembled reporters in the back of the room. “Terrible people. Not all of them. Honestly, not all of them. I’d say 85 percent,” he added. “When you get good ratings, you can say anything,” the president added. Here’s a shot of a Trump campaign staffer at the same Indiana rally blocking the lens of a camera aimed at a protester being removed.